Education: do we do it to children or with them? When you look at the children’s faces in the portraits of this book, you will see their eyes pleading for the with answer. The essays and vignettes also present clear, passionate and evidence-based arguments for the with approach. This collection of essays and photographs by a long-time progressive educator and photographer explores the art of teaching, the minds of children, and how the educational infrastructure stifles the growth of both. The portraits of schoolchildren taken over six decades invite pause and reflection — what are they asking for? Innocents examines educational practices, debates and theory, and advocates learning with children rather than teaching to them. This is a passionate book about the intersection of education and the love of learning. I have come to believe that if I hadn’t left the university behind I never would have tried writing anything beyond equations; equations that might or might not have mattered to anybody else. Perhaps it also had to do with turning forty and that certain amount of pondering that comes then. Well too, my wife of 18 years and mother of 5 children chose to divorce me and she would keep the home and the children. I was the one to pack up and move, from Michigan to Colorado. I didn’t start writing a book yet. I stopped writing equations and began writing about the view from within my head. I wrote about what it was like to have the sheriff’s deputy serve those papers that said I didn’t have my children any more  on fathers day. I went on to get involved with an alternative school, a bad second marriage, restaurants, a successful third marriage, but a life deeply rooted in that Colorado land that I moved to. It was a cow-calf operation, but it was, as my neighbor Stan insisted, farming. Clean the ditches, irrigate the fields, put up the hay, and the cattle were just what happened to hay over the winter. There is a lot of time to think in this farming business. The physical task may be at the long end of an irrigating shovel, but he mind is free to wander where it will. Just as irrigating and pulling barbed wire produces order on the land, the mind too attempts to create order about a life. After about 30 years of this I realized that I was down to the last steps; I needed to write the book. The book would symbolize order, one page after another, from front to back. In writing the book it all would become ordered and clear. What have I learned that might actually be useful in my life? Write if you feel like writing. Absolutely do not write if you don’t feel like it. If the writing ought to be a book, you will know it at exactly the right moment. Now that I have these words and photographs in order, it turns out that I do care if anybody else cares. For my head, the book was roughly like a cow having her calf. Once the thing is out, it can be licked dry and cared for. George S. Stranahan is a lifelong educator. In 56 years of teaching he has left his mark in army, university, primary, high and charter schools. He is a founder of Michigan Montessori Internationale, the Aspen Community School, the Early Childhood Center, the Carbondale Community School, and the Roaring Fork Teacher Education Project in partnership with the Graduate School of Education at Colorado University Boulder. 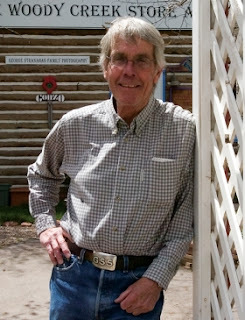 Stranahan served as Executive Director of the Aspen Educational Research Foundation (now COMPASS), and sat on the boards of the Aspen Institute and Colorado Mountain College, among many other community foundations and nonprofit organizations. Stranahan is also a lifelong student. He received his B.S in Physics from the California Institute of Technology, and after two years in the Army, his M.S. and Ph.D in physics from Carnegie Institute of Technology. He eventually completed a Postdoctoral fellowship with Purdue University and has even learned the art of ranching from working the irrigation and fields on his Colorado ranch. He has been featured in Education Week, Engineering and Science, Newsweek and several other education journals and magazines. His first book, Phlogs: Journey to the Heart of the Human Predicament, released in 2009 and won the Colorado Book Award’s Best Pictorial Book and The Indie Next Generation’s Grand Prize for Coffee Table / Photography Book. The author’s next essay and photography collection, A Predicament of Innocents, releases in February 2013 and features local schoolchildren spanning 30 years. Stranahan’s photography has been exhibited in museums across the country, including the Toledo Museum of Art, New York Metropolitan Art Museum and Southport Summer Festival in Boston. The passionate educator has received numerous accolades throughout his career, including the 2012 Jackie Morales Distinguished Award for Community Service; 1997 Martin Luther King, Jr. Humanitarian Award; 2011 Molly Campbell Service Award; 2005 Kentucky Colonel commission; and 2002 Aspen Hall of Fame induction. The Mayor of the City of Denver proclaimed “George Stranahan Day” on November 2, 1996. But his primary concern has been the role of education in building and shaping today’s society. His six children fired his passion for nurturing the problem-solving abilities and creativity in every single child. Find out more about George Stranahan on his Website, Twitter, and his page at PeoplePress.Org. I havent heard of this book ever.. but I really like the sound of it! Also, great guest post!